Are you keen to add Python as a programming skill? 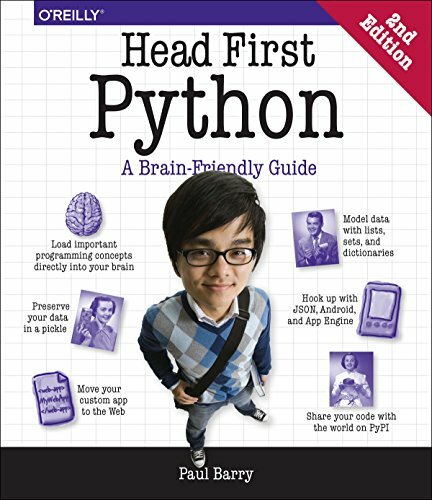 Learn quickly and have some fun at the same time with the second edition of Head First Python. This updated book takes you beyond typical how-to manuals with engaging images, puzzles, stories, and quizzes that are proven to stimulate learning and retention. You’ll not only learn how Python differs from other programming languages, you’ll also learn how to be a great Python programmer. Learn how to work effectively with data and persistence in Python. Exploit Python's iteration technologies, letting you loop like crazy! Do more with less code by creating your own decorators and context managers. Build Python-enabled web servers and web applications. Based on the latest research in cognitive science and learning theory, Head First Python uses a visually rich format to engage your mind, rather than a text-heavy approach that puts you to sleep. Why waste your time struggling with new concepts? This multi-sensory learning experience is designed for the way your brain really works.